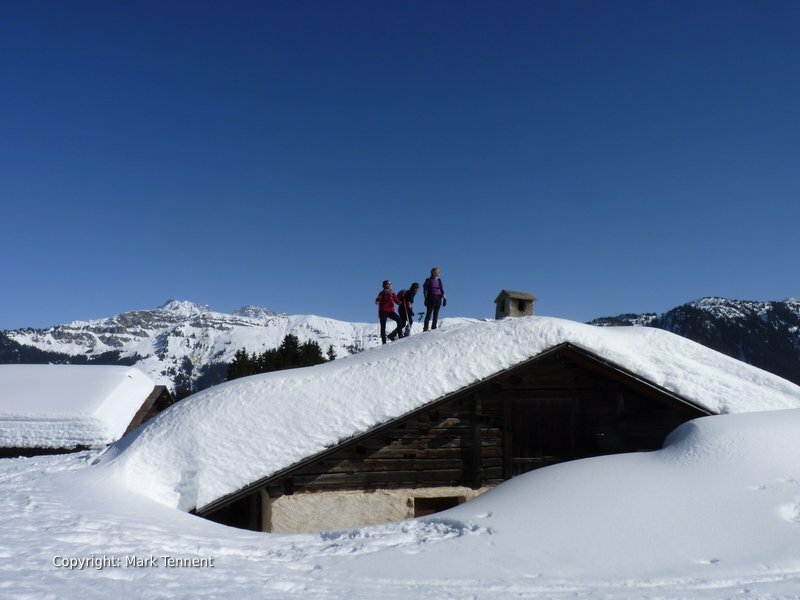 6 day snow shoe walking / 7 nights in the heart of the Beaufortain Mountains. Authentic and unspoilt mountain region. Guiding by Mark, International Mountain Leader. Free loan of snowshoes, ski/walking poles. Based at the charming Hotel Les Ancolies** in the village of Arêches. 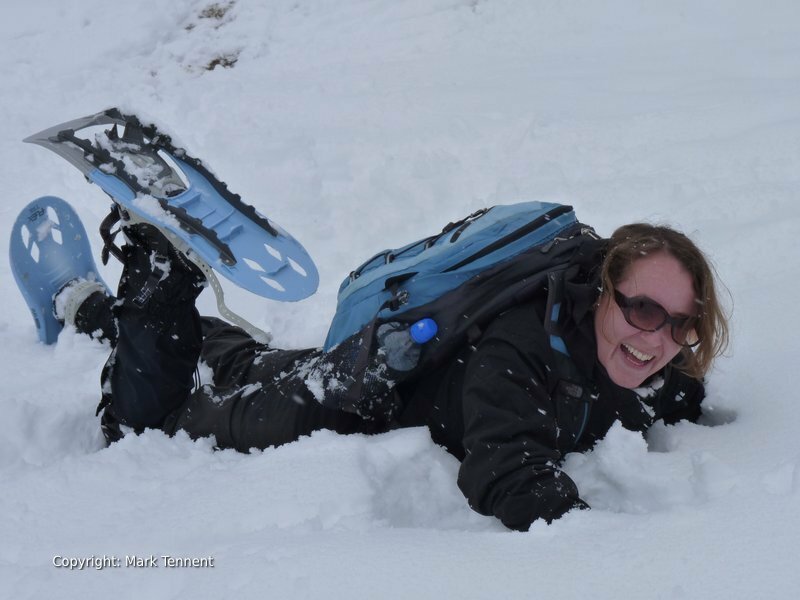 Join me on this guided snowshoe walking week in the Beaufortain. 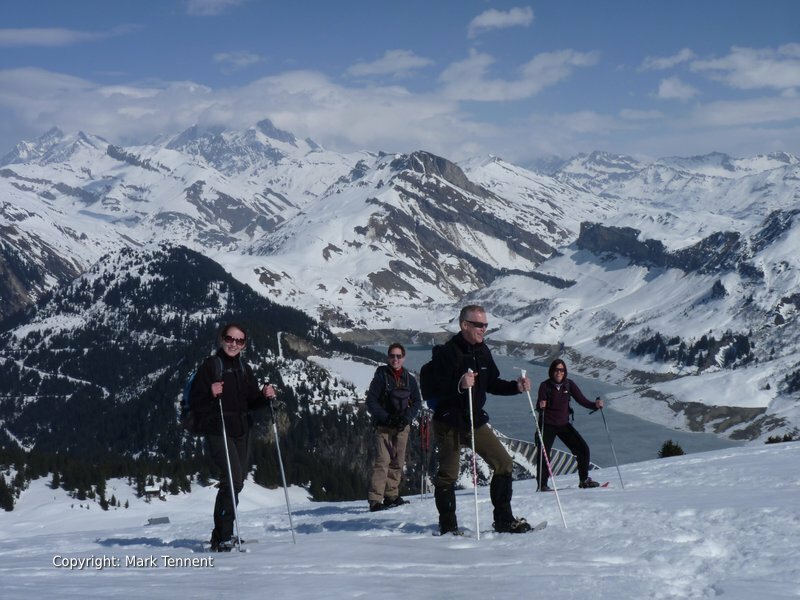 6 days of snowshoe walks in the heart of the French Alps based in a delightful, family run hotel. The Beaufortain is situated about 20km South-West of the imposing bulk of Mont Blanc. 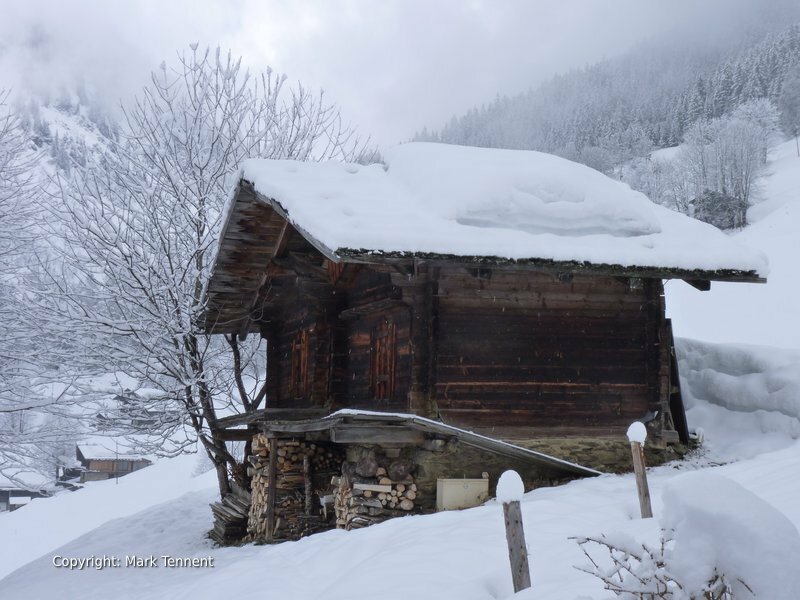 It retains an authentic charm where traditional Savoyard wooden chalets blend into the hillsides. The smell of woodsmoke curling up from cosy wooden chalets. Each day we will enjoy a snowshoe walk taking in the variety and beauty of the area. Turquoise watered lakes reflect the hills with the snow and ice-capped mountains of the Mont Blanc Massif as a backdrop. 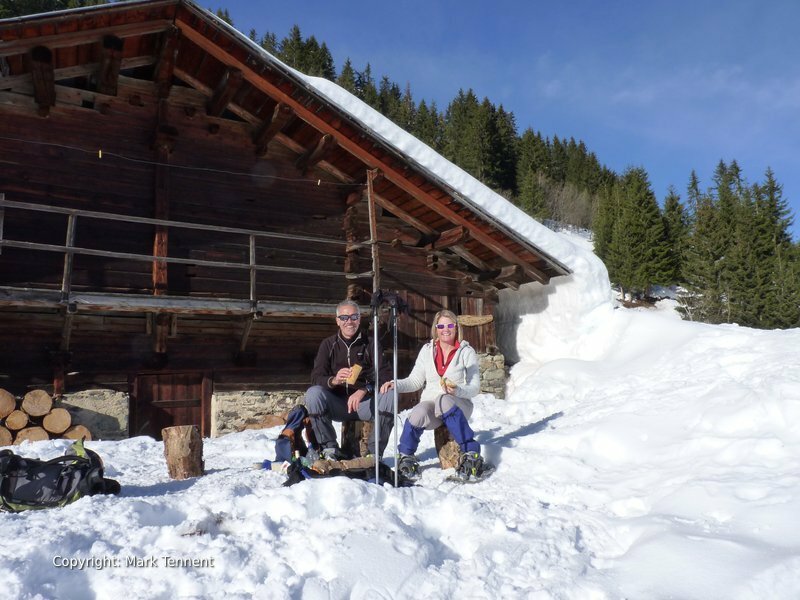 Our snowshoe holiday is based from the Hotel Les Ancolies** in the village of Arêches (c.1000m above sea level) in the heart of the Beaufortain. The village is a real, authentic, Savoyard village without the trappings of the large resorts. The hotel is situated right in the centre of the small village with a sunny terrace and cosy bar area. Dinner is served in the dining room and you can enjoy the local Savoyard specialities. Breakfast is taken adjoining the bar where you can enjoy fresh croissants, bread and cereal if you wish. Arêches / Beaufort is about 30 mins from Albertville and reached by a road that winds along the river Duron. 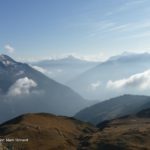 In summer it is possible to continue over the Cormet de Roselend and drop down past Chapieux to Bourg St Maurice in the Tarentaise valley. In winter this route is blocked with snow and will not open again until the spring. 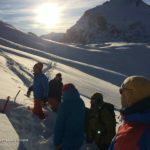 Sat – Arrival and transfer to Arêches – Beaufort. Settle into your hotel and a chance to explore the village. Sun – Roche Pastire (2108m) via Le Col du Pré (1703m). Fantastic views of the mountains including Mont Blanc reflected in the turquoise waters of the Lac de Roselend. 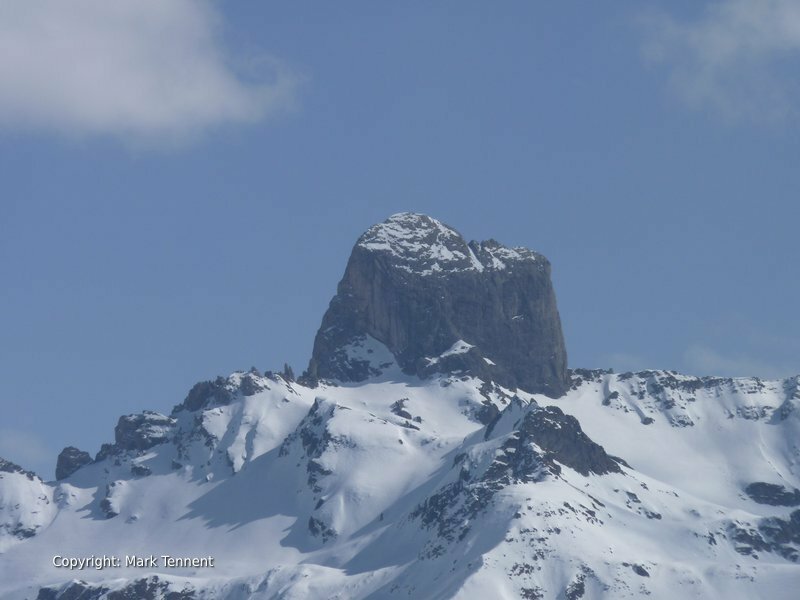 Mon – Today we will drive up to the Col des Saisies. 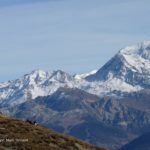 Les Saisies is home to a large cross-country ski area on a broad ridge with great open views across to the Aravis mountain range and Mont Blanc. Just outside Les Saisies we will set off along a forest track that gradually rises across the mountain side. 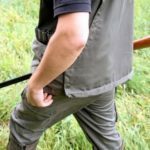 There’s a possibility we may see deer in the forest. Our route continues at moments in the forest and others with open views across the Val d’Arly. A short traverse takes us out on to a small spur and a lovely spot for a picnic. After lunch we climb gently across open slopes to reach the Chard du Beurre. Now we start our descent through open woodland with mountain ash, spruce and pine. Tue – Mont Clocher (1976m) from Hauteluce. Departing from the pretty village of Hauteluce we climb a spur towards the broad ridge that extends from Les Saisies towards Mont de Vorès. Wed – Roche Plane. Departing from the hamlet of Le Dray we climb to Plan Villard. Passing through sparse pine trees draped in snow we arrive on more open slopes and views of the Legette du Mirantin. Reaching a plateau on the broad spur we traverse a large bowl towards the Roche Plane. A gentle descent brings us to Lac Couvert and Le Clou. Return via the forests of La Frasse on a silent, snow covered route. Thu – Le Lac de St Guerin. A very short drive takes us to the hamlet of La Mappaz and the end of the cleared road. We will wind our way up through clearings and woodland to reach a plateau area above the main treeline. Here we get lovely views across the valley. Our route now leads us gently along in the mountainside. I will find a spot to enjoy our picnic lunch quite possibly overlooking the lake with views up the valley towards the Cormet d’Areches and the Cret du Rey. After lunch a short descent leads us down to a view point above the lake. We will now turn for home passing old chalets and a church built for workers during the construction of the dam. 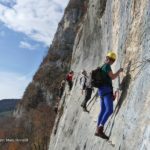 Fri – Lac de la Girotte. Leaving from Les Granges we ascend steadily to reach La Commanderie and then a small col overlooking the Lac de la Girotte. Sat – Departure after breakfast and transfer to airports. Min / Max Group size: 2 – 8 – Private tours available.